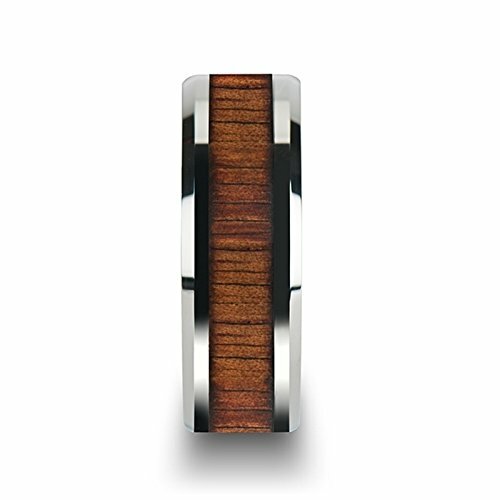 This gorgeous tungsten and wood inlay style from our wood inlay rings line is made using the hardest tungsten carbide and the finest authentic African Padauk wood inlay. This design creates an elegant balance between new world metal and traditional wood, which has been used in jewelry making for centuries. Padauk wood is also used to manufacture of musical instruments and even used as medicine. This comfort-fit band has beveled edges and comes in 6 mm, 8 mm and 10 mm for couples who prefer a matching set. This is the perfect wedding band to represent your love and commitment. Truly Free Lifetime Sizing and Lifetime Warranty on all tungsten rings, no exchange|sizing fees, which are charged by our competitors. Koa is a�Treasured�and Valuable Hardwood that Represents Integrity and Strength, which are Foundational Qualities of a Marriage.